The Beautiful Godzilla is a particular kind of urban female cyclist who rides as though the rest of the world were created simply to yield to her … She also rides an old three-speed or perhaps a 10-speed or Dutch city bike, carries her handbag on the edge of her handlebars and if she has a basket it usually contains a small dog or perhaps a baguette… Her approach to cycling in a densely populated city is a combination of self-entitlement and Mr Magoo-type dumb luck…. Like any self-entitled person, she can’t imagine a car would possibly hit her, even if she’s riding against traffic and it’s coming right at her. Actually, you sort of find yourself disappointed when it doesn’t. And just like Mr Magoo would wander into a construction site and a girder would materialise right as he was about to walk off the scaffolding, the Beautiful Godzilla blithely rides through red lights and busy intersections, emerging on the other side unscathed and just as photogenic as she was when she entered it. Why other cyclists don’t like them: They should be dead but aren’t. She actually arrived literally the day before we left for Italy, so the first real test rides didn’t take place until our return. She is not only beautiful to behold, but is quite a dream ride, in that upright, city-cruising-in-a-skirt kind of way. Lighter and quicker than I expected. And did I mention – beautiful to look at? 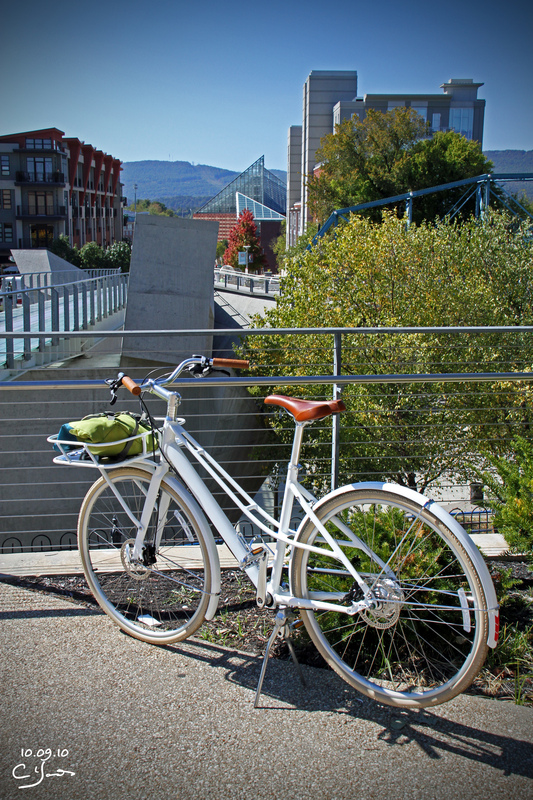 I have ridden her on a couple of 20-mile trips to and around town, and even with only 8 speeds, she handled every incline with ease. The front integrated rack will carry essentials and more with no difficulty – a loaded messenger bag, a bag of groceries, or even a Godzilla-appropriate designer handbag with miniature dog and baguette. 😉 Or my bag full of camera stuff. As you can tell, I am very infatuated. Sometimes you just have to ride like a Beautiful Godzilla (even if you are just pretending). 😉 Call me if you want to meet up for a latte. oh my gosh she’s beautiful! Congratulations! 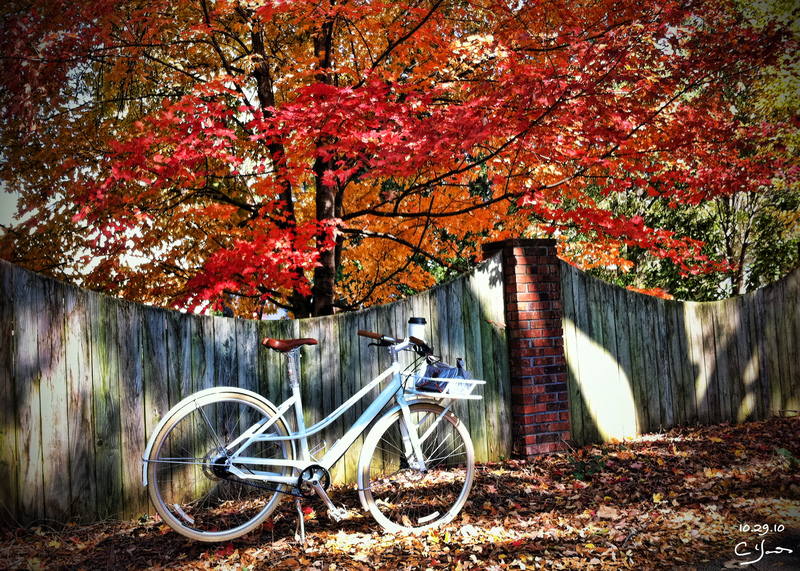 I love my Globe Live 2 Mixte, Brown Betty. You really can carry a small dog in the basket–my sister, Buttons, sits in the basket very peacefully even when other dogs bark at her as we whiz by. Bikerly took the words right out of my mouth. I was just about to post the exact thing. You really know how to pick them. Quite gorgeous! I was longing for this bicycle last year, and instead my husband ended up with a Globe, but I still find myself eyeballing them every once in awhile. 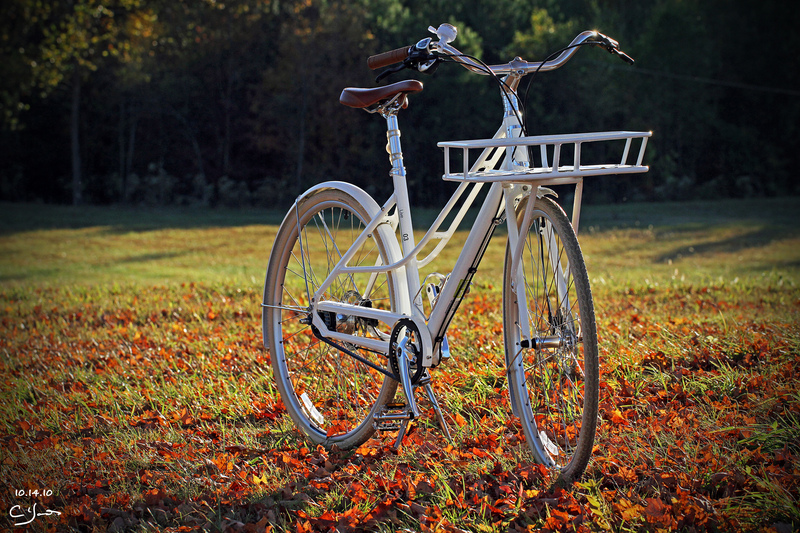 The white is gorgeous against the autumn colors as well. I knew I should have trusted my first instinct not to look – now I’m consumed with jealousy 🙂 Do you know the weight of the Globe? Gorgeous bike and I love that style, but since I keep talking about how I really need to invest in a bike that’s good for hills and doing longer rides (since unfortunately, they aren’t going away in Atlanta – haha), not sure I can justify getting another bike even heavier than mine because it’s pretty. Soon, I’d have a stable of bikes because they were pretty, but not a single one to ride distances. WOW. That is really nice looking. I have that Alfine setup on my commuter bike (and will have it on my new ANT as well), and I LOVE it. Enjoy! Love it! 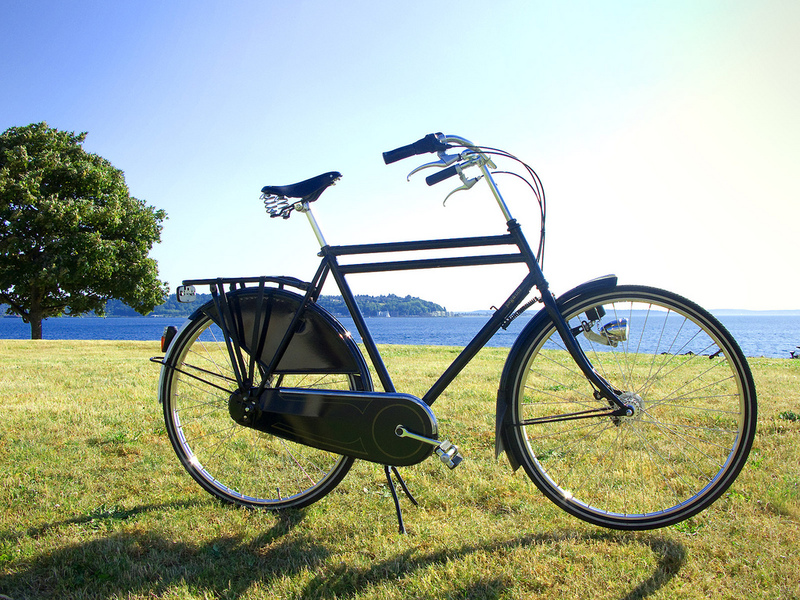 I really like the idea of a clean, no maintenance belt drive on a city bike. 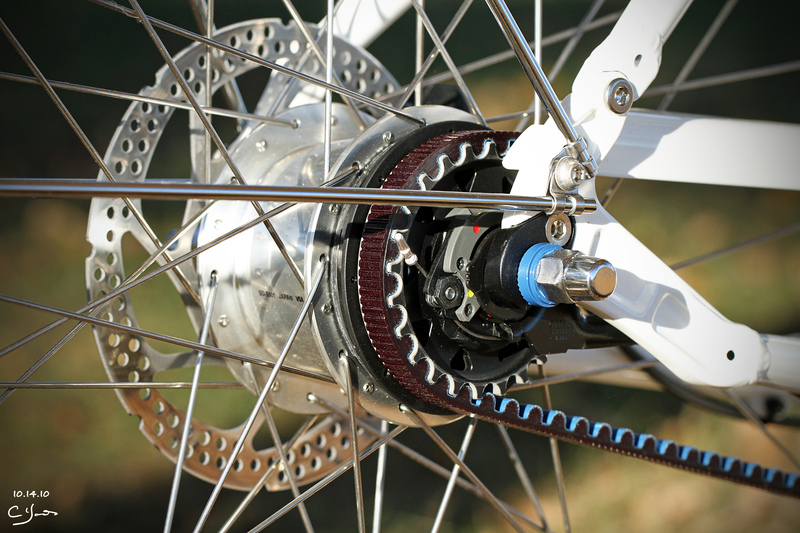 Belt drive? Whoa! That’s cool and looks really sweet as well. Elisabetta is a beauty. I’m jealous but also very happy for you. Do you have names for your other bikes? I’m still trying to pick names for mine. My road bike has to be somewhat goddess related, I think. Very nice! 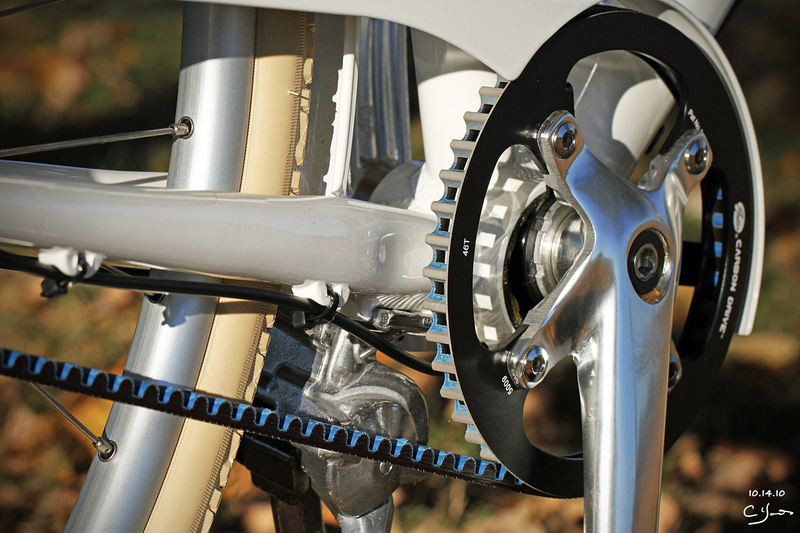 I haven’t ridden a belt-drive bike yet, but I’ve heard great things about them. 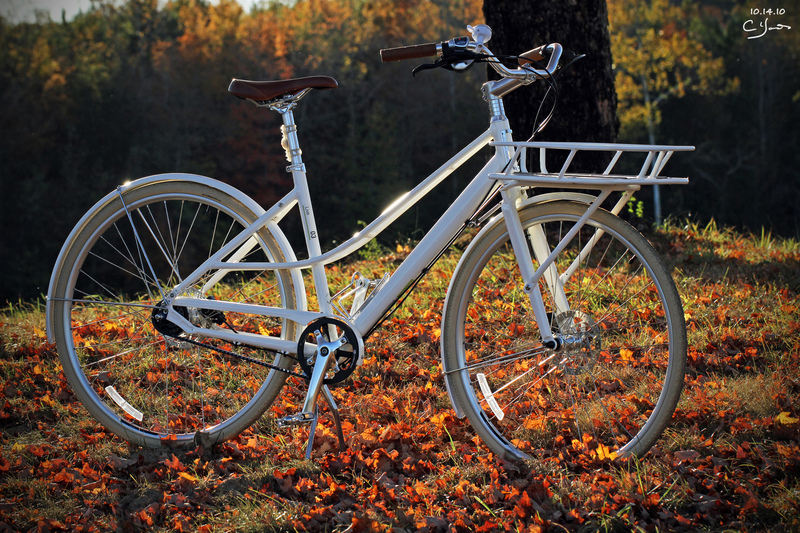 I’ve also been eying the Globe bikes, and been very tempted — though I don’t know that I really need one. But “need” is a relative term when it comes to bikes!